Imagine a teenage girl confined to a wheelchair being lifted on to the back of a horse. Fore the first time in her life, she will know what it feels like to walk. Take a blond haired little boy who had a stroke before he was born and has limited use of his right arm and leg. Watch him balance atop a chestnut mare. Could his hand be made strong enough to hold the handlebars of a bicycle, catch a ball or clutch a crayon? The goals and benefits are different for every child, depending on their individual needs. 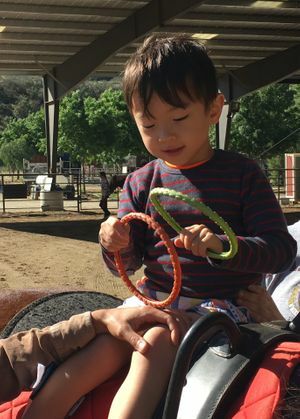 The movement of the horse causes an inherent response from the child, relaxing muscles that are tight, increasing tone in muscles that are weak, building balance, coordination and control, increase motor skills, improvements in behavior and sensory processing. Carousel Ranch is unique as we work to create individualized goals for every student served. The program utilizes the sport of vaulting (gymnastics on a moving horse), English, and Western riding. Each child is served individually (no group lessons, with up to three people working with each child. We strive to work on the same things that are being targeted in traditional forms of therapy, taking it out of a clinical setting and creating an atmosphere where therapy is disguised as fun. If you have a child with special needs (or know someone who does) and are interested in enrolling, please call us at (661) 268-8010 for more information. An initial phone interview will place your child onto our waiting list. Any child with any disability is eligible (3 months old and up). From the most severely disabled to those with learning disabilities, an individualized program will be developed to suit each child's needs and goals. Fees are based on ability to pay...and we strive to offer scholarship assistance for those in need. If you do not live in our area and are looking for a program closer to home, please visit Professional Association of Therapeutic Horsemanship International (PATH Intl.) for a complete listing of programs.